One of the latest addition to Bangkok’s thriving night market scene is ChangChui in Thonburi district. The term ‘”chui” refers to being disorganised in the Thai language but do not be deceived by its name—the huge lifestyle space is a one-stop destination for everything art related. Think fashion apparel stalls, concept cafes, food trucks and a vintage cinema for the film buffs. 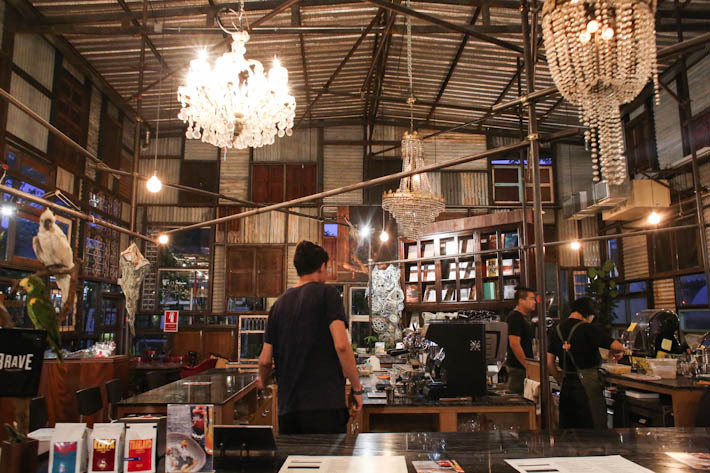 The creative co-working space looks more like a page in a fairy tale book than the usual boisterous Thai night markets you are used to seeing in Bangkok. If you are thinking of visiting this creative night market in Bangkok, here are 7 Things Not To Miss Out When You Are In ChangChui. It is impossible to miss this old aeroplane right smack in the middle of ChangChui market. Yes, you can now imagine how enormous this market is; there is still plenty of space to roam around. 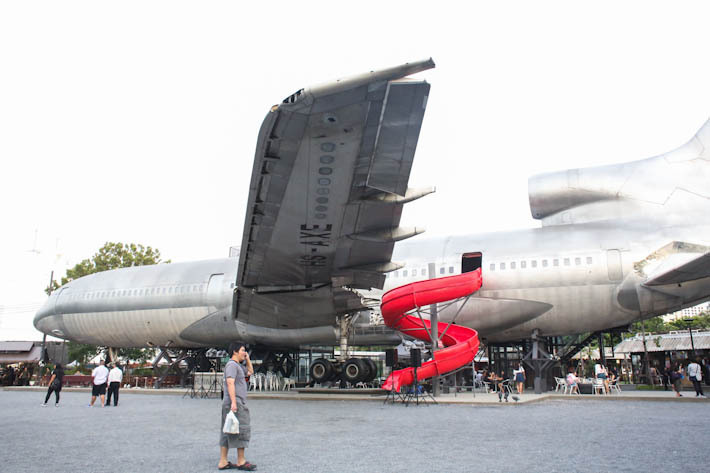 Spice up your Instagram feed by taking your OOTD pictures right in front of this aeroplane! The inner hipsters in us were thrilled to see all these food trucks around the market. If you are feeling hungry from all the shopping, head to any of these vans and get yourself some bites. 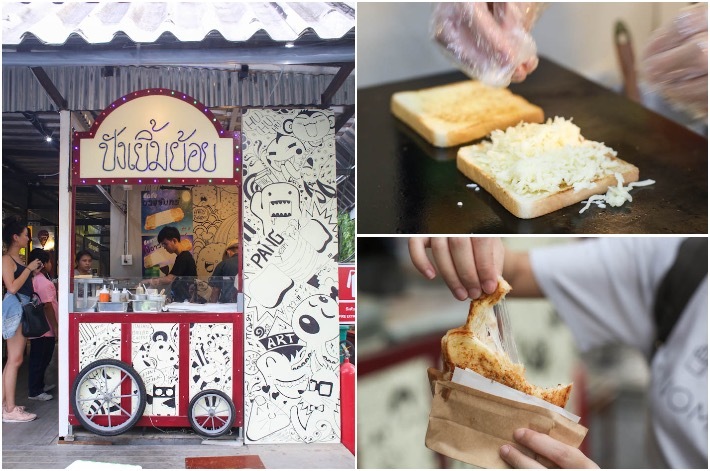 Check out this cheese toastie stall in ChangChui—the generous amount of melted cheese sandwiched in between lightly toasted bread is our idea of perfection. Do not forget to do a cheese pull for your Boomerang video! You can get a cheese toastie for THB49/S$2.03 at ChangChui. There are many takeaway kiosks offering finger food such as grilled squid where you can have them on the go too. Those who are feeling peckish but not in the mood for a full meal can go around trying various kind of light bites as you walk around. For a taste of local food, drop by Mr. M food van and try their Green Curry Fried Chicken Rice and the Original Fried Chicken Rice with Spicy Sauce. While the food is not the best we have tried in Bangkok, they are decent for its price point. Both are going at THB65/S$2.67 each. There is no lack of good coffee shops in ChangChui but the one that left the deepest impression on us was One Ounce For Onion. While the lifestyle cafe is not new to Bangkok, we would still recommend visiting this concept outlet at ChangChui. Bookworms will enjoy browsing the collection of books displayed around the coffee bar. A night of reading paired with an aromatic cuppa is one of the best ways to unwind from the pressures of life. Prefer al fresco seating instead where you can take in the cool night breeze? Head over to Oldman Cafe where you can indulge in craft beers, live music and a menu showcasing a selection of western food. For the uninitiated, ChangChui is a project by Somchai Songwattana—the owner of Flynow which is an established fashion brand in Thailand. As the brainchild of a clothing designer, you can expect ChangChui to be home to many fashion apparel brands. With so many options there, surely there will be something that will catch your eye! No creative space is complete without the addition of a tattoo parlour as tattoo art is an extremely popular way of self expression. If you are feeling up to it, you can even make a bold statement by getting an outrageous tattoo art. Just be sure you won’t regret it afterwards! Are tattoos too extreme for you? Not to worry! You can try your hand at shooting games instead. We are more than glad to see this classic fun fair attraction in ChangChui as the game never gets old. Skip your usual cinemas and come to this vintage theatre instead. Instead of blockbuster movies, you can expect screenings such as documentaries and films by local talents. On top of that, do keep a lookout for occasional performances as well. Entry to ChangChui sets an adult back at THB100/S$4.11. However, it is complimentary for those who are disabled and all children below 120cm. For more recommendations, read our guide on 28 best cafes in Bangkok.